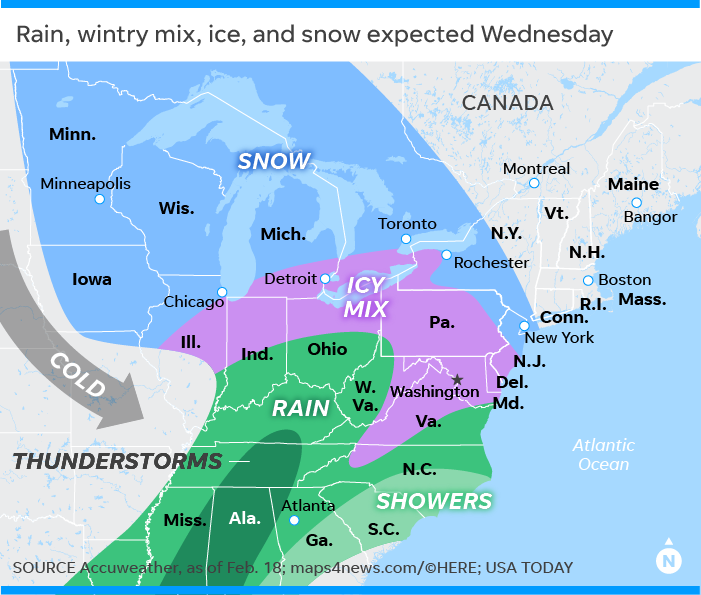 Every state east of the Mississippi is likely to get winter storm effects Wednesday, including Detroit, Chicago, Philadelphia, New York, Washington. ARLINGTON, Va. – A sprawling storm so massive it simultaneously dumped snow in Minnesota and Virginia and heavy rains from Indiana to Alabama fueled weather havoc Wednesday in every state east of the Mississippi River and beyond. In the North, snow totals were tamped down by a more dangerous winter storm weapon – ice. Detroit, Chicago, Philadelphia and Washington were among major cities hit with inches of snow, with sleet moving in behind it. More than 200 million people will feel the storm's wrath before it finally rolls into history Thursday. A Kansas woman died when she lost control of her vehicle because of snow and ice. "The heaviest snow will be over central Pennsylvania," said AccuWeather senior meteorologist Alan Reppert, who should know. AccuWeather is based in State College, Pennsylvania, where classes were canceled at sprawling Penn State University. He was right on target, as two Pennsylvania cities – Chambersburg and Upper Strasburg – reported 10 inches as of mid-afternoon, the highest total for the eastern part of the storm. Almost everyone who got snow could look forward to a chaser of sleet and freezing rain, Reppert told USA TODAY. "At least snow allows for some traction," Reppert said. "Ice can be unforgiving." Always-exciting thundersnow was also reported in Ohio, West Virginia and Maryland. In the central U.S., 11 inches was reported in Belle Plaine, Minnesota, the highest total for that part of the storm. The snow that fell in Minneapolis on Wednesday pushed the city to its highest February snowfall total ever, at 30.4 inches, the National Weather Service said. Airline traffic was under siege: More than 2,100 flights were canceled or delayed into and out of metro Washington's three airports by 2 p.m. Almost 1,000 were reported at Chicago's O'Hare alone; Philadelphia International had more than 300 flights delayed or canceled. The National Weather Service's forecast for parts of Virginia on Wednesday was several inches of snow followed by ice and sleet. Its warning of dangerous commutes was a recurring theme across much of the nation. "Travel will be very difficult," the notice said. "The combined weight of snow, sleet and freezing rain could result in downed branches and isolated power outages." In Washington, D.C., federal offices were closed, although emergency staff and teleworkers remained on the job. School closings in major cities and their environs stretched from Minneapolis down to Kansas City and east to Washington and Philadelphia. In suburban Arlington, the school schedule has been plagued by a string of closures and late openings all winter. High school math teacher Bill Drake was preparing to begin digging out amid heavy snowfall that was forecast to turn to ice. "I love snow days as much as the kids," Drake said. "It’s hard to make up for missed time in the classroom, but the extra time with my family is a huge bonus." Classes were also canceled at Georgetown University in Washington. Freshmen John Picker, 19, and Mia Smith, 18, grew up in California and Texas, respectively and haven't seen much snow. The impact was more serious elsewhere, with officials posting vehicle restrictions on some Pennsylvania highways, urging people to monitor snow and ice. A travel advisory was in effect for New York City through Thursday morning. "Use mass transit, allow for extra time, and exercise caution when traveling," the city's emergency management team warned. Daily snowfall records were set Tuesday in North Little Rock, Arkansas; and Omaha and Lincoln, Nebraska; all of which received several inches of snow, AccuWeather reported. A quarter-inch of ice weighed down branches and power lines in Boone County, Arkansas, knocking out power for 2,000 households on Tuesday night. Car accidents and road closures also paralyzed parts of Nebraska, Kansas, Missouri and Iowa, AccuWeather said. West of the Rocky Mountains, more than a foot of snow was expected through Thursday night in some of the major mountain ranges from Washington and Oregon into Arizona and Colorado. In the South, Alabama, Mississippi, Louisiana, Tennessee and Kentucky were among states facing heavy rains and flash flood warning and watches. Much of the region was saturated from weeks of rains before the latest storm rolled in. Flood watches and warnings cover the northern parts of Alabama, Mississippi, and Georgia, and nearly all of Tennessee is at risk for floods. "Some areas of Alabama and Tennessee could get six inches of rain from this system," Reppert said. "It might not stop raining until Friday." And in the far West, a “potent and cold” storm was expected to drop up to 3 inches of snow on the outskirts of Las Vegas starting Wednesday night and continuing into Friday morning, the weather service said.